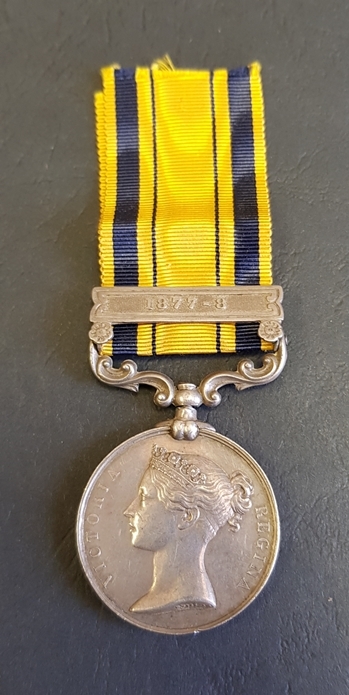 -	South African General Service Medal with clasp 1877- 8 to Pte. J.J. Waldeck, Sissison’s Hse. John Waldeck was born in the Eastern Cape in about 1841 to parents whose identity is unknown. The Waldeck’s were a hardy bunch, a combination of Prussian and English 1820 Settler blood ran through their veins and made of them ideal men and women to survive the vagaries and hardships of life on the eastern Frontier of the Cape Colony. The land with which they farmed was often far from arable and they had not only the harsh climatic conditions with which to contend – the local native tribes, the Gaikas and the Gcaleka’s, originating from the Transkei region further east, were hell-bent on thieving and destruction. Thieving in that the settler’s crops and livestock were routinely plundered by marauding bands of Kafirs and destruction because they often left men and women dead in their wake. Growing up in this environment could not have been easy and it was seldom achievable alone. To this end most settlers married and had a number of children who, when they were old enough, were put to work on the farm or married off to men of the local settler community. The Waldeck with who we concern ourselves was, according to the Methodist Church Register for Queenstown, married to a Sarah Elizabeth Windell, aged 18, on 9 January 1861. Waldeck was a Farmer residing at Oxton Farm in Whittlesea near Queenstown and a bachelor. The whole country was in a state of transition. A changing economy, prosperity from diamonds, gold and a taste for ostrich feathers were beginning to rouse the land out of its pastoral slumber. In September 1877 Sir Bartle Frere departed Cape Town for the Eastern Cape, he found the frontier districts in a restless state. A mood had arisen on the back of a rumour about a conspiracy among the black nations to drive the white man out of the conquered territories. A violent squabble which had broken out a few weeks before, between the ‘loyal’ Mfengu (Fingoes) of the Transkei and their Xhosa neighbour, the independent House of Galeka, had aggravated the prevailing anxiety. A few days later, Frere left for the Transkei to hold talks with the dissident chiefs. But Sarhili (Kreli) of the Galekas, Paramount Chief of the amaXhosa, refused the invitation to meet with the High Commissioner. He offered a string of unconvincing excuses, but what the old chief feared was that promises might be wrung out of him that he might not be able to keep. An influential war-party, emboldened by guns purchased on the diamond fields, had arisen in Galekaland which was opposed to further concessions to the white man. Angered by the Galeka rebuff, Frere issued a warning to Sarhili making him responsible for all transgressions into Mfengu territory, and returned to Kingwilliamstown to prepare for war. The first clash between Galekas and a colonial force took place on 26 September 1877 on a hill called Gwadana, when a mixed force of Mfengu and troopers from the Colony’s Frontier Armed and Mounted Police (FAMP), commanded by Inspector Chalmers, engaged a Galeka party that had sacked a Mfengu kraal. Burgher volunteers, it was decided, were going to have to be relied on to fight this war. The colonial effort grew rapidly, and on 18 October, the Galeka homeland was invaded with 8 000 men (two thirds of them black levies) divided into three columns. The lightly equipped, fast-moving columns encountered little opposition in their drive to the coast, and the pursuit continued into neutral Bomvanaland. Galekaland was turned into a desolation of burnt-out kraals and empty grain-pits. It was the huge herds of confiscated cattle that slowed the invaders and helped Sarhili’s people escape. With the men eager to return home with their loot and the supply-lines starting to disintegrate, the chase was called off and, by the middle of November the war was described, officially, as over, and the Galeka army ‘entirely extinguished.’ The volunteers streamed home as fast as their mounts could carry them but, in reality, the war was far from over. It was soon to enter its grimmest phase. It was after Christmas of 1877 that Colonel Glyn considered himself to be in a position to take action in the Transkei using Imperial troops. His strategy was to use three columns driving to the coast, then an eastward swing to Bomvanaland. Included in the General’s instructions to Colonel Glyn had been the injunction ‘prevent Kreli from passing over Fingoland or across the Kei and the colonial border into the Gaika locations’. Sarhili had been kept out, but a Galeka party, led by Khiva, the tribe's most distinguished warrior, had eluded a patrol from Komga, and reached the Ngqika reservation. Khiva was no renegade headman like Makinana, and an appeal for help from so noteworthy an emissary could not be ignored. The Ngqika chief, Sandile, veteran of two hard-fought frontier wars, was well acquainted with the penalties of defeat, but the voices for war were very persuasive, and on the last day of 1877 the people of Ngqika broke out in rebellion. The Ngqikas were reported to be hiding in the bush- and boulder-filled canyon known as the Buffalo Poort. The plan was to ascend the highland plateau that overlooked the poort from three directions, converge on the hide-out, and squeeze them out of the bush on to the plain below where a line of infantry would be waiting to receive them. But the enemy stayed out of sight, unless it was to lure the unwary into an ambush, and remained two jumps ahead of the highly visible forces. The first offensive in the Amatolas, hampered by rain and mist, failed. Unseen the Ngqikas slipped past the sodden line of infantry, moved westwards, and entered another wilderness known as the Lotutu Bush. Five companies of the 90th Regiment were moved up from Fort Beaufort and a cordon was thrown around the Lotutu Bush. But the Ngqika defiance had inspired other Xhosa clans from the Ciskei to rise up, and Sandile had been reinforced in his refuge. When the second offensive began, the Xhosa broke through under the cover of darkness, and once again, entered the Buffalo Poort. It was only when the tactics that the colonials had been urging for weeks was adopted that the campaign swung in the Colony’s favour. The eastern part of the Amatolas was divided up into eleven military districts. In each a mounted garrison was stationed. When a Xhosa party appeared it was pursued until it entered the district of the neighbouring garrison which in turn took over the chase. In this manner, pursuit and harassment were uninterrupted, with the pursuers remaining fresh and never far from their supplies. In addition earthworks, manned by infantry detachments, were thrown-up near the, by now, well known exits from the Buffalo Poort. The winter weather brought hardship and sickness to the garrisons in the Amatola highland, but far more wretched was the condition of the half-starved Xhosas in the sunless ravines. The fatal wounding of Sandile in a chance encounter with a small Mfengu patrol, ended the Ngqika will to continue what, all along, had been a hopeless war. In July, Sandile’s sons surrendered, and in August Glyn’s army was brought back from Galekaland, the territory pacified, but Sarhili still at large. A reward of £500 was now offered for the capture of Sandile, and an attempt was made to surround that portion of the forest occupied by the rebels and either make them prisoners or destroy them. From the 10th to the 17th of March the troops and colonial forces were engaged in this task, but the area of operations was so extensive and the ground was so difficult for Europeans to traverse that they met with much less success than they hoped for and the operation was called off. But what of Sissison’s Horse in the conflict? Joseph Sissison, a Murraysburg man who considered himself a loyal British subject, commanded Murraysburg’s local Volunteer Cavalry. In 1878, he led the Volunteer Cavalry and Auxiliary Force in the Gaika Campaign and in May that same year, he was instructed to raise a regiment. Under the name of Sissison's Horse, it fought in Bechuanaland. In January, 1879, Sissison was called on to raise a second regiment, the Northern Border Horse, which defeated Chief Klaas Lukas and restored order in the northern territories. In truth it would appear that the Murraysburg Volunteer Cavalry and Sissison’s Horse were one and the same unit commanded, as they were, by the same man. An article in the London Daily News of 13 March 1878 reported that, “There has been the usual series of petty skirmishes this week, and the record of casualties is saddened by a terrible accident, resulting in the death of 5 men and wounding of some 7 others. The Murraysburg Cavalry were escorting ammunition wagons to the front and were outspanned some few miles from King Williams Town, when a severe thunderstorm came on, and a flash of lightning struck one of the ammunition wagons, causing a terrific explosion. 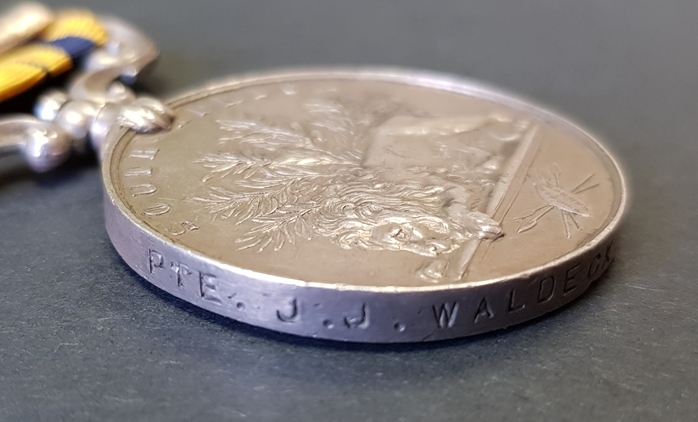 That Waldeck saw action cannot be doubted – for his service he was awarded the South African General Service Medal with 1877-8 clasp. 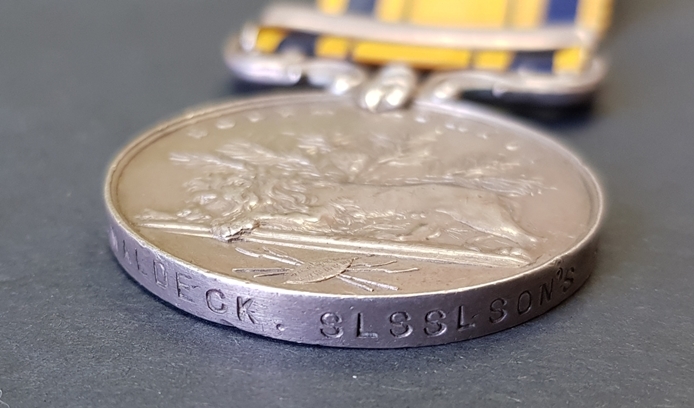 It would appear that he didn’t initially claim the medal as it was only issued on 27 August 1907 with the naming convention peculiar to Cape Town jewellers Armstrong & Company. Very little is known about his later movements and it is left to the Death Notices in respect of his children in order to learn more about him. His daughter, Annie Susannah Gurney, died at the age of 24 on 17 January 1890 in Hebron in the Orange Free State. She had been born in Queenstown in about 1866 which places Waldeck there at the time of her birth. Thank you a marvellous bit of E Cape military history. As far as I'm aware it is the only medal issued to that unit. I was reading the earlier thread on Sissison's Horse ( angloboerwar.com/forum/11-research/10683...ssissons-horse#25023 ). 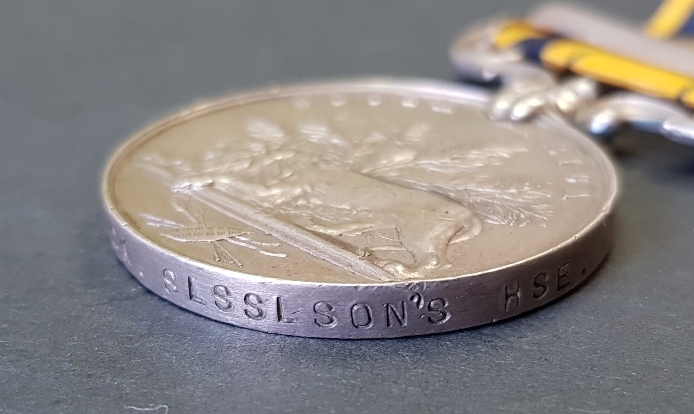 Peter's comment started me thinking how the medal to Captain Sissison was named. Was it to Murraysburg Volunteer Cavalry? I'll ask David. As you can see they are mounted in a frame and perhaps difficult to see. 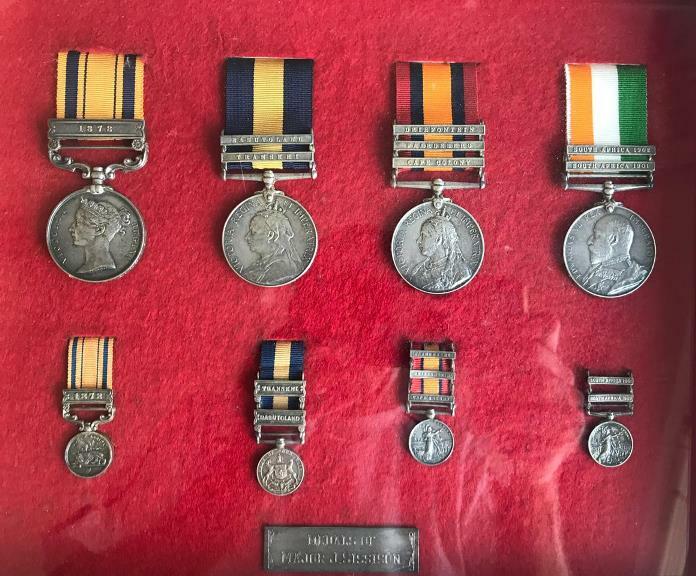 That's a fantastic group of medals.